Art that shows places, people, and events which exist in the imagination began fascinating me early in my teens. I'm also fascinated by that which exists within the universe; exists beyond; or might exist. My images are, perhaps, what happens when those interests merge. Taking a virtual camera with me when I let my mind's eye off the leash lets me share what I find with you. I started getting serious about writing, art, and photography, in high school. Those skills eventually helped me get a job in a publishing company's marketing department: where I honed my design skills and developed carpal tunnel syndrome. My hands and wrists have been fixed, so the pain is gone: but nerves serving my thumbs and first two fingers haven't regenerated completely. That's an annoyance, since I discovered that having a numb thumb and fingers makes drawing accurately very difficult. I can still take snapshots, of course: but many of my subjects exist only in my mind. Happily, there are a great many resources available for someone with a computer and imagination. I let my mind's eye off the leash every Monday; see what the Lemming, a flannel-wearing alter ego, is up to; or visit one of the Lemming's acquaintances. By Friday morning, I've got another snapshot from my virtual camera. If I think they're ready for release, I post them here. Getting lost in the crowd hasn't been an option for me. I'm still not sure whether I stand out, or others steer clear of me, and that's another topic. Several decades of undiagnosed major depression, and an autism spectrum disorder, kept my life interesting. But my glitchy neurochemistry may be part of a tradeoff that gave me freakishly enhanced language skills, and a knack for seeing things differently: so I can't complain. Not reasonably. Assorted prescribed medications, including a powerful antidepressant, make it possible for me to think without fighting the machinery these days. That's a wonderful change of pace. My name's Brian H. Gill. I live in a small town in central Minnesota, a few hundred miles from the center of North America. I was born in 1951, and eventually got undergraduate degrees in history and English: with art history, photography, library science, plus about two years of computer science, on the side. I've been an English teacher, a beet chopper, radio disk jockey, sales clerk, researcher/writer, flower delivery guy, graphic designer, employment interviewer, and held quite a few other jobs. Skills and experience acquired in an eclectic career help me imagine worlds that might exist: but don't. As far as we know. About my screen name, Norski: it means "Norwegian," a tip of the hat to my Norwegian ancestors. We're the short, dark-haired Norskis, not the blond giants you read about. The other half of me is mostly Irish, which shocked and dismayed one of my ancestors, and that's yet another topic. I suspect that the laid-back Irishman with his feet on my mind's controls often drives his no-nonsense, by-the-book Norwegian counterpart batty. There are many Norskis, happily, so I often use Aluwir as my screen name. It's a contraction of something in old Indo-European, and that's yet again another topic. I talk — write, actually — more about myself in "About Me and This Blog ," in A Catholic Citizen in America. And that's still another topic. 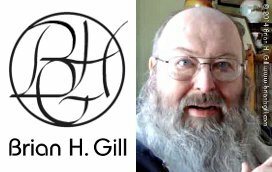 My virtual 'front porch,' where I spend the most online time, is on Google Plus: Brian Gill. Even so, I think my DeviantArt profile is the best place to contact me about art. I read Comments on my DeviantArt profile (norski.deviantart.com) every 24 hours, so that's a good place to get my attention.